Dave Volkman used to grow produce on his 12-acre Maineville, Ohio, farm. But by attending a workshop on growing hops taught by OARDC scientist Brad Bergefurd, Volkman learned about the crop’s strong demand and profit potential. He traded in his produce for hops as a result. Today, Volkman has more than 400 hop plants on 12 acres, which supply two Ohio craft breweries. He also formed the Ohio Hop Growers Guild, which brings together more than 50 of the state’s growers. Hops are a key ingredient in beer manufacturing. And thanks to OARDC’s ramped-up research on the crop, they’ve returned to Ohio after a 100-year absence. With Ohio-grown hops in high demand from Buckeye State brewers, the economic potential for growers and the state’s economy is significant. About 100 Ohio breweries produce about 1 million barrels of craft beer annually. At 4 pounds of hops per barrel, that takes 4 million pounds of dried hops, which cost more than $30 million. Most of that — for now — is sourced out of state. 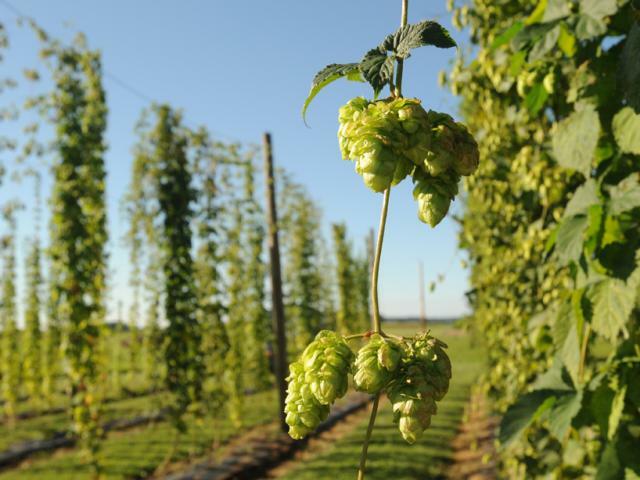 At current use rates, Ohio craft brewers need about 6,000 acres’ worth of hops. To contact the scientist: Brad Bergefurd at bergefurd.1@osu.edu.